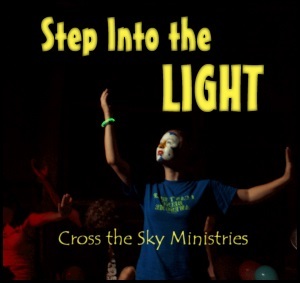 Step Into the Light is a mime drama about the light of Christ and God’s call to live faithfully in the midst of darkness. The drama is based on 12 original songs written by the friends of Cross the Sky Ministries. The director’s booklet contains everything you need to know to get up and running including instructions on clowning, makeup, costumes, face painting, lighting, stage setup, all the scenes, and Bible study questions. The mime drama is perfect for a youth group to perform in church, for a family night, or as a special presentation for Sunday School. Mime ministry is a powerful tool! The final show is the pinnacle of a lot of time and hard work. Putting on a mime drama has the ability to draw your youth group closer together, to open up the lines of communication and cooperation within your congregation, and give your youth a greater sense of accomplishment. We pray it will breathe new life into your church’s ministry. A song of celebration, awakening, and prayer to seek the light of God in our lives. Encouragement to step into the light of God as we share our faith with those around us. A hymn to remind us who we are in Christ and how together we are the light of the world. An earnest prayer of seeking and yearning to remain in the holy light of Jesus Christ. Mime Booklet Director’s manual with scene descriptions, song lyrics, make-up, props, etc. Choose a complete package or a single item from the menu below and select Add to Cart. For permission to make photocopies of the musical booklet, add the full copyright use fee to your order. $3.00 shipping will be added per line item for online orders. We ship via priority mail.